so I was a bit bored and not in the mood to paint my nails and decided to finally go through my stash and reorganise. Most of all, I had to purge! 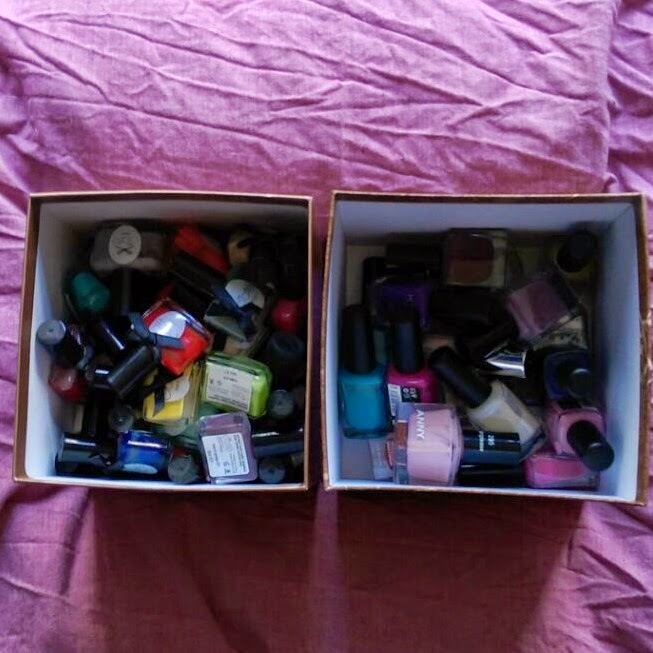 There were quite a few polishes sitting on my shelves that I just never reached for, but kept for the sake of having them, which makes no sense at all. 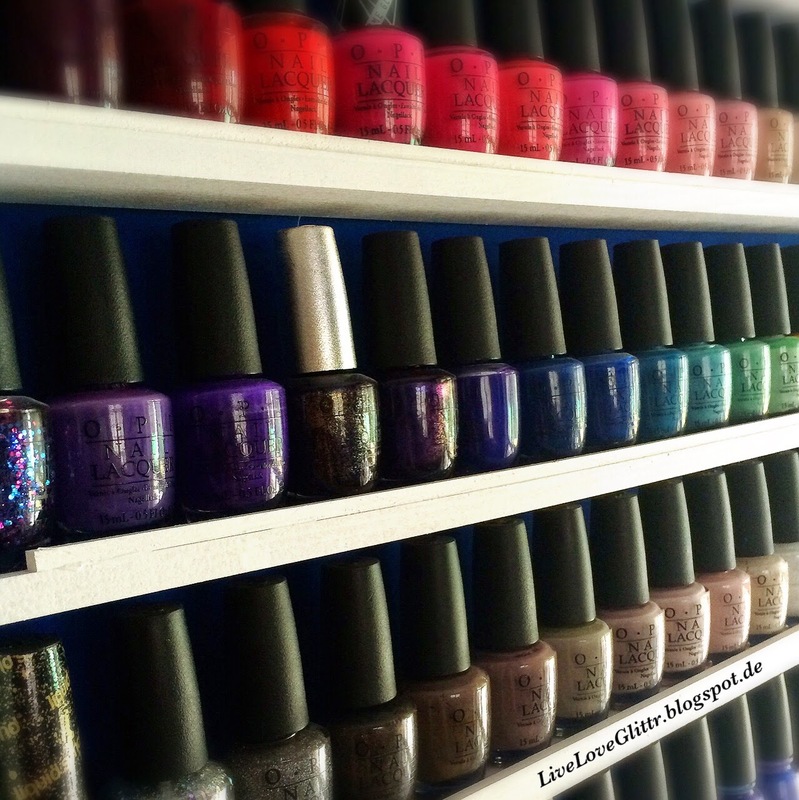 The biggest rack holds all my favourite and most reached for polishes. As you may be able to tell from the crappy pic, I have been collecting Essie, OPI, China Glaze and ColorClub. Those are for sure my favorite and most used brands atm. There are also some Sally Hansen X-Treme Wear polishes in there, but they will probably move over to one of the other racks soon. 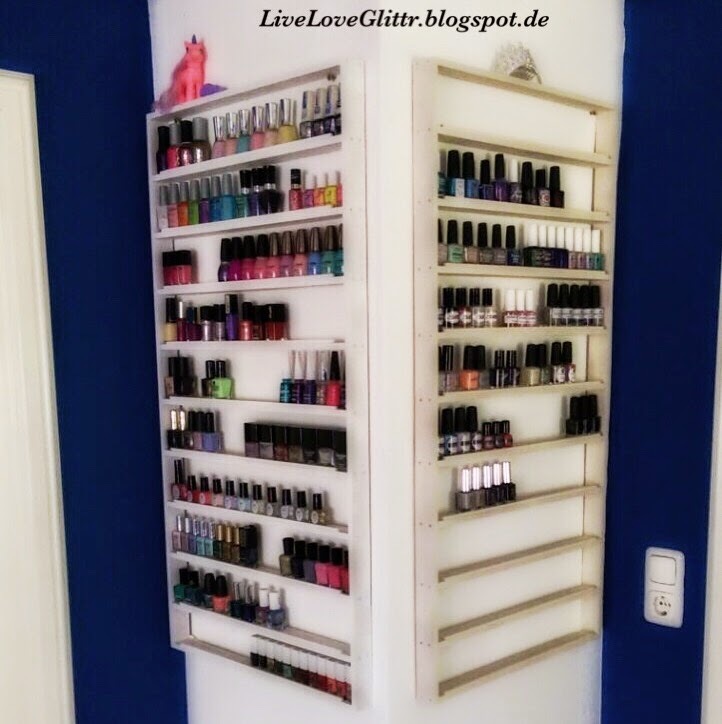 This is one of the “smaller” racks 😉 This was one, that I really sorted through thoroughly and made myself get rid of a lot of polishes. At the top, you can see my four Orly polishes, 6 neon-speckled YesLove polishes and four Isadora ones from the Sugar Crush line. In the second row I have mostly Wet’n’Wild and then some ColorClub mini glitter toppers. Row three has the three Lancome red/pink shades I own and a bunch of SinfulColors. 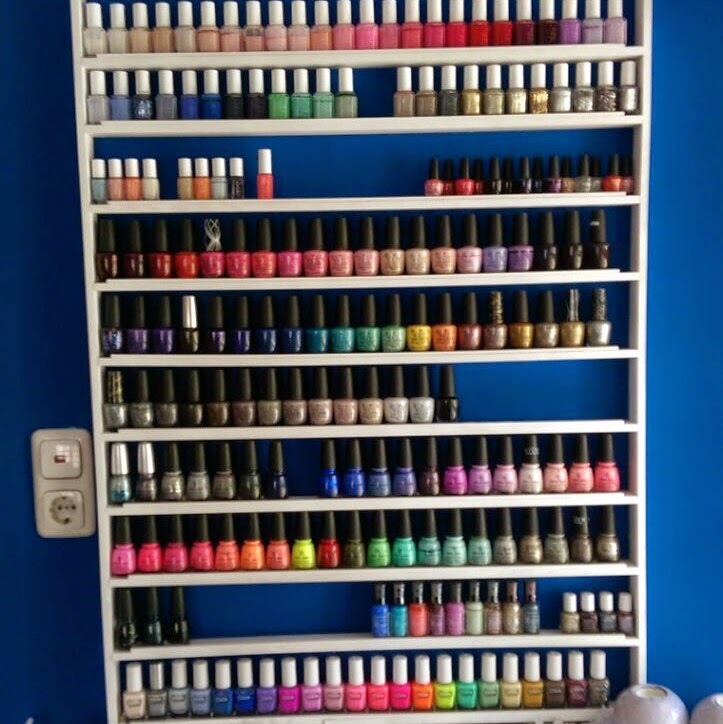 The fourth row holds miscellaneous polishes where I only have one from each brand. The next row has my Bonita and Fresh Paint polishes where there are more to come, as the rest is still in my untried drawer. Then there are some Flormar polishes which I am not too sure about, but still want to give another chance. Row six stars off with my collection of Kiko polishes I cut in half! I just wasn’t using them, the ones that I thought were unique I kept, so I’m down to 5 Kikos. Then there are some ButterLondons, of which also two made it into the discard pile. Next are my Ciate polishes, all from the MiniManiMonth Advent Calendars. I have to say, the thought of an Advent Calendar filled with polish is more than I could ever wish for, but Ciate just doesn’t really do it for me. I got rid of most of them, only kept the colors I really liked and the glitters. So I went from 48 Ciate’s from two years of Advent Calendars down to 11. I did keep all the caviar beads and other loose glitters (8 in total), but put them into my nail art drawer. In the eighth row I have my Barry M’s, most of which should actually be in my untried drawer.. Then there are my Zoyas which I love, but they had to live in this rack as I only have six of them. The next row has some miscellaneous polishes I have two of but no more and the last row has all my Elf minis I won in a giveaway. My other rack holds all my Indies, it’s just as big as the other one but it doesn’t have as many polishes in it. Top row has all the Indies I only have one of, next row has my PicturePolishes and Glampolishes, third row houses my LoadedLacquers, Polish Me Silly’s and Laquerlicious (now Polish’M). Fourth row has all brands I only have two of, like Emily De Molly, Peita’s Polish, CrowsToes, MckFresh Nail Attire and Lilypad Lacquer. My Pipedreampolish A Night In Vegas Collection will be moving in here soon too, but right now it’s still at my nailers station as I know I’ll be doing some more designs with them soon! To be honest, I’m not even quite sure what I’m going to do with all of these… Let my friends go through them to make their picks and then donate the rest? Probably. Looking at my collection makes me feel happy and a bit queasy at the same time.. I can’t believe I’ve spent so much money on polish!! On the other hand, it’s what I love and it is my hobby, so I don’t feel too bad. Other people probably have even more expensive hobbies, right? !